Achalau in the Quechua language means “how beautiful”, which is a good description of this perfect eight-day trek through the Huayhuash. This route visits almost all of the places the classic complete loop does, the main difference being that the days’ walks are longer, so it’s a bit more strenuous. Along the way you will visit many lakes such as Mitucocha, Carhuacocha, Siulacocha, Viconga, etc., and see at close range soaring snow-covered peaks like Hirishanca, Siula Grande, Yerupaja, Ninshanca, Etc. Day 1: Huaraz - Llámac - Cuartelwain 4170m. Day 2: Cuartelwain – Qaqanan pass 4750m - Carhuac pass 4600m - Carhuacocha 4138m. Day 3: Carhuacocha - Carnicero pass 4630m - Huayhuash 4330m. Day 4: Huayhuash – Portachuelo pass 4750m - Viconga 4407m. Day 5: Viconga - Cuyoc pass 5000m - Guanacpatay 4300m. Day 7: Inkawain - Tapush pass 4800m - Qashpapampa - Yaucha pass 4750m - Jahuacocha 4070m. • There is an alternative footpath (short cut) from Carhuacoca to the Huayhuash camp site that passes very close to the mountains Siulá, Carnicero, Jurao, and the lakes Gangrajanka, Siulacocha and Quesillococha, the latter of which is also known as Tres Lagunas (three lakes). If you are considering this route you will definitely want a guide to show you the way. • From Viconga campsite to the Guanacpatay valley the walk is not long, so upon arriving in the Guanacpatay valley, in about two hours you can climb to the San Antonio viewpoint (5000m) from which you have a nice view of Siula Grande. This mountain was the scene of the Joe Simpson’s famously barely-survived ordeal recounted in the book and the film, “Touching the Void”. You also have views of the lakes Jurao and Sarapococha, and other peaks. You return to the campsite in Guanacpatay by descending the route of your ascent. 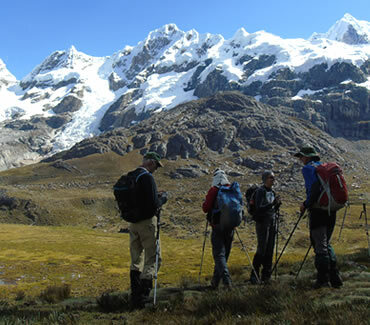 • Before beginning this trek, it is essential to have at least two days of acclimatization. You can take one of the daily tours to the Llanganuco lakes or to the Chavin de Huantar ruins (by car) and/or you can do day hikes in the Cordillera Blanca around Huaraz. •	Bring warm clothes along, because in the mountains the temperature can quickly fall below 0 °C, especially in the early morning, at night, and even when the sun drops behind the clouds. 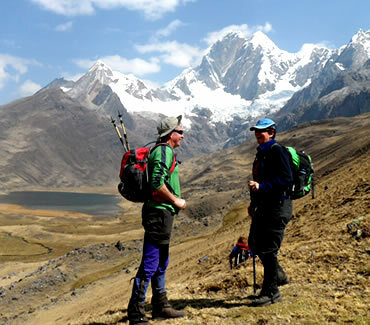 •	Walk at your own rhythm, breathe deeply, and enjoy the beautiful views of Cordillera Huayhuash.